The July 2012 versions of Technical Reports 1 - 8 supercede the March 2012 versions. The updated versions feature a cover page on each Technical Report, corrections of typographical and grammatical errors, and minor clarifications in the text of the Technical Reports. A separate Appendix compendium has been added to Technical Report 2. No changes have been made to the factual findings of the Technical Reports originally published in March 2012. Anton et al., 1988, Nitrate in Drinking Water, Report to the Legislature, SWRCB. 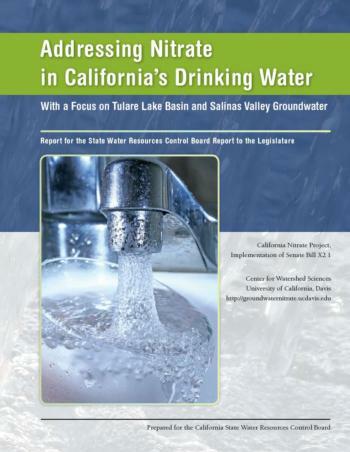 Staff, January 2013, California Communities That Rely on Contaminated Groundwater, Final Report to the Legislature, SWRCB. Science Advisory Board, 2011, Reactive Nitrogen in the United States: An Analysis of Inputs, Flows, Consequences, and Management Options, U.S. Environmental Protection Agency. United Nations High Commissioner, Drinking Water and Sanitation in the United States, United Nations 2011. Sutton et al., 2011, The European Union Nitrogen Assessment. Tomich et al., 2012, The California Nitrogen Assessment. Dubrovsky et al., 2010, Nutrients in the Nation’s Streams and Groundwater, 1992–2004. US Geological Survey, Circular 1350. United Nations Food and Agriculture Organization (FAO), 2012, Report on the Future of Sustainable World Food Production. Thomas Harter (Video) - Beneath the Tulare Basin: A Tour of Groundwater and the Many Paths of Water to Wells.